​As I have said before 2019 is definitely the year of the Tristar. JC Wings rediscovered the Witty mould in 2018, but put ugly landing gear on it, and Gemini then cut and shut it to create an appalling Tristar 500. 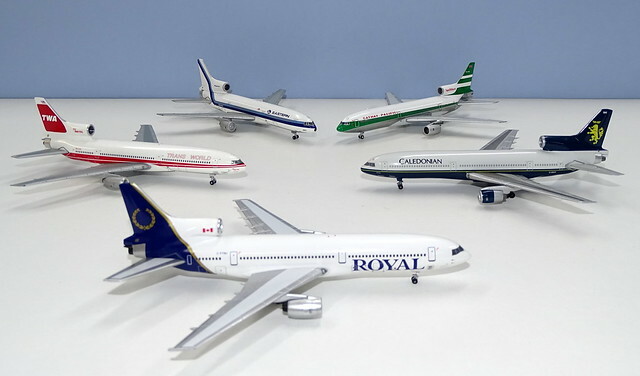 Neither of these were the Tristars that we were looking for and that was partly because NG Models had already shown an interest in producing the L-1011. They aren’t alone and within the next few weeks you can expect to see more Tristars, but for now let’s look at what NG Models is offering. A big shout out to the guys over at DAC 'barison82, doug_seeley, Mr Denny Payne and Transpac787' for their extra info about the frisbee fairing and Tristar mods. Appreciated guys. ​NG Models had said that they would produce all three major variants of the L-1011 and they have, as we have come to expect, been true to their word. In this post I’ll look at the moulds for the Tristar 1 and the later updated Tristar 1/150/200s which gained the Frisbee Fairing fin fillet of the Tristar 500 under the no 2 engine. 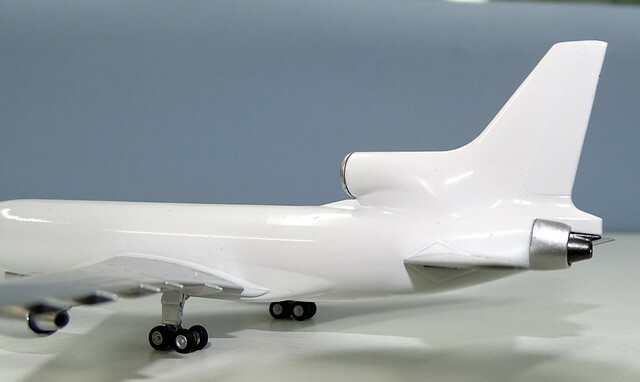 There have been 5 previous standard Tristar moulds (if you treat the original Witty and the updated JC Wings version of the same mould as two) but none have really got the unusual and iconic look of the Tristar nose and tail correct. Above: Tristar 1 on the left and Tristar 200 on the right. The best is definitely the Witty Wings Tristar but even before JC Wings and Gemini Jets mucked it up by putting chunky short rolling gear on it the mould wasn't perfect. The cockpit to nose transition isn't correct, the model sat too low at the rear and the wings were oddly too low at the tips. I had previously lobbied for the Witty Tristar to be reused but I am glad to say that this is no longer necessary as the NG Models Tristar outstrips it across the board, and there is a second Tristar 1 mould on finals as I write this. 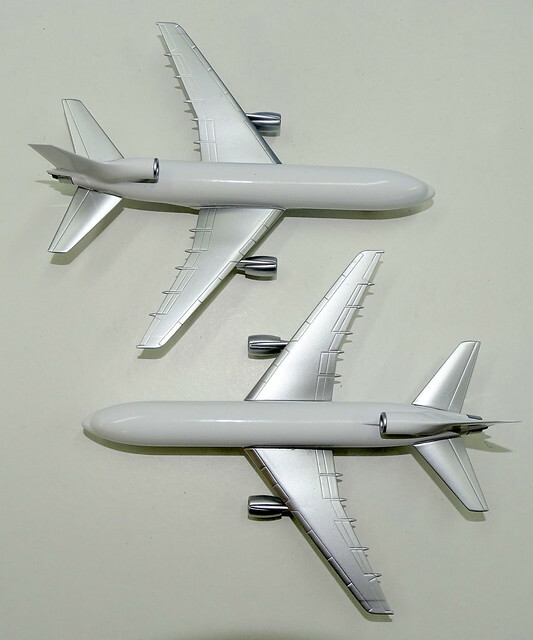 Unlike for the A330 (which NG have also just released a new mould for) the Tristar offers fertile ground for new releases since there is effectively an empty field with all previous Tristars warranting replacement to varying degrees, and plenty of liveries that have never been made at all. The baseline Tristar had the square fin fillet connecting the centre no 2 engine to the upper fuselage. All the early Tristars looked effectively the same but some were upgraded later on with the modified fin fillet of the Tristar 500 and Tristar 200. Interestingly comparing the photo above with the model below the real thing looks longer, however I have measured the mould and it is the correct length. The photo above is also taken at a low angle looking up. It is a little difficult to tell for certain without the characteristic cockpit windows printed on but I think the cockpit and nosecone are a triumph. In fact it is the first mould to get these so close to correct. The landing gear is a good height and well detailed BUT the nosegear doors are too large. The tyre is also perhaps slightly too big but that is not really an issue. Modifying the nosegear doors should be easy enough I'd hope. Here is the nose region compared with the other existing moulds. Only the original Gemini Jets gets close to getting it as correct. The NG nosegear is better than everyone elses aside from that of the original static gear of the Witty Wings Tristar. One of the issues with the old Witty Wings Tristar and the revamped Witty used by JC Wings and Gemini is the angle of the wings. 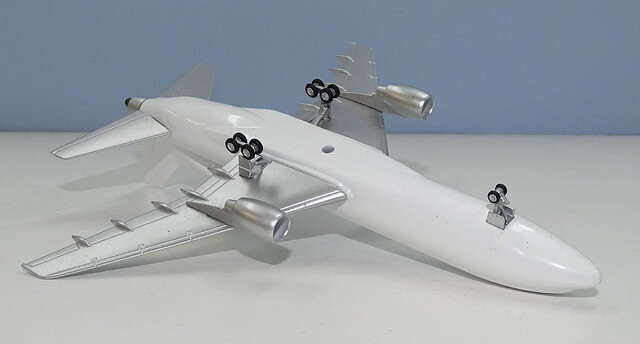 The updated model isn't helped by the too short undercarriage but nonetheless outboard of the engines the wings don't angle up as they ought to. This isn't a problem with the new NG mould. The wing angle on the NG is very good and compares well to the old Gemini and Dragon moulds which are accurate. Another feature of the new NG mould is that the engines and engine pylons are all one piece. The engine nacelles look good and have great fan detail. The exhaust is perhaps a little too long. It is however the engine pylon which gives me some concern. I think it is holding the engines too low and the underwing and overengine shape of the pylon looks too angled. Compared to the other older moulds the engines look good but you can see that the NG has its engines the lowest of all of them. Check out the size of the rims on the Blue Box above! The tail is without a doubt one of the most important parts of a Tristar and here NG have knocked it out of the park. The Witty Tristar, in both its incarnations, has easily the best tail of the older moulds but I think the precision and shape of the NG is better than even that. The complex curvature around the no 2 engine is particularly good. The rest of the mould is very precise and accurate. The underneath and maingear are strong. In particular the finesse and detail of the maingear is very impressive, although perhaps the maingear doors are a little large. The shorter Tristar 500 pioneered many new features some of which were applied to the standard length Tristar. These included a modified airflow diverter under the no 2 engine known as the Frisbee Fairing, after its designer Lloyd Frisbee. The Frisbee Fairing was fitted to the new Tristar 200 and 250 series. It is a sign of real dedication that NG have gone to the trouble of also making a Tristar 200 mould with the new fin fillet, as since the tail and fuselage are one piece it is not a simple task. For completists I'll point out that this mould cannot stand in for a Tristar 250 (there were only 6 aircraft so upgraded), which also have the extended wingspan of the Tristar 500. The Frisbee Fairing reduced the noise level in the rear cabin and might have had some economic benefit too. As well as Tristar 200s it was included on six very late build (1980/81) Tristar 1s for Delta (730-735) and five late build Tristar 100s for TWA. In 1979 TWA had begun retrofitting the fairing to its Tristar 1s and 100s but was the only airline to upgrade its L-1011s with the fairing. I have given my feedback to NG and they have said they will fix all three areas of concern, but even without these fixes I think this is an excellent pair of moulds. With the minor modifications they will be almost invincible. It'll be interesting to see how the other new Tristar 1 mould, incoming from Scotland soon, compares.